Fully wireless Bluetooth earbuds are still a new concept, and yet the next generation is already at hand. A small number of companies are preparing advanced noise-cancellation tools to give users full control over just how much background noise reaches your ears. 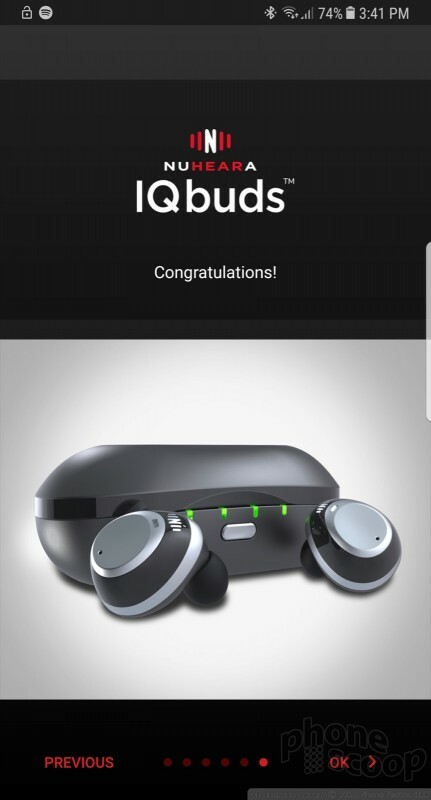 Nuheara's IQbuds are an early entrant. Here are our thoughts. Active noise cancellation (ANC) is one of the best features of modern headphones and is a must-have in noisy spaces, such as airplanes or subway platforms. Brought to the consumer masses by corporations such as Bose, ANC relies on microphones and advanced software to (mostly) eliminate the distracting din around you. The result is a cleaner and quieter listening environment so you can focus on your music, not your surroundings. Until recently, ANC was an all-or-nothing affair. As great as it is, ANC comes at the expense of hearing things around you, such as those important boarding announcements at the airport. Moreover, ANC has often been reserved for large, over-the-ear style headphones, because they have the battery capacity and built-in noise-muffling ear pads to further improve the results. Now, makers of small earbuds are adopting ANC, and doing unique things with the technology. Nuheara's IQbuds may be tiny in-ear Bluetooth buds, but they deliver ANC with an added twist: you can control the strength of the noise-cancelling algorithm. In effect, the IQbuds make it possible to adjust ANC on the fly to match your surroundings. 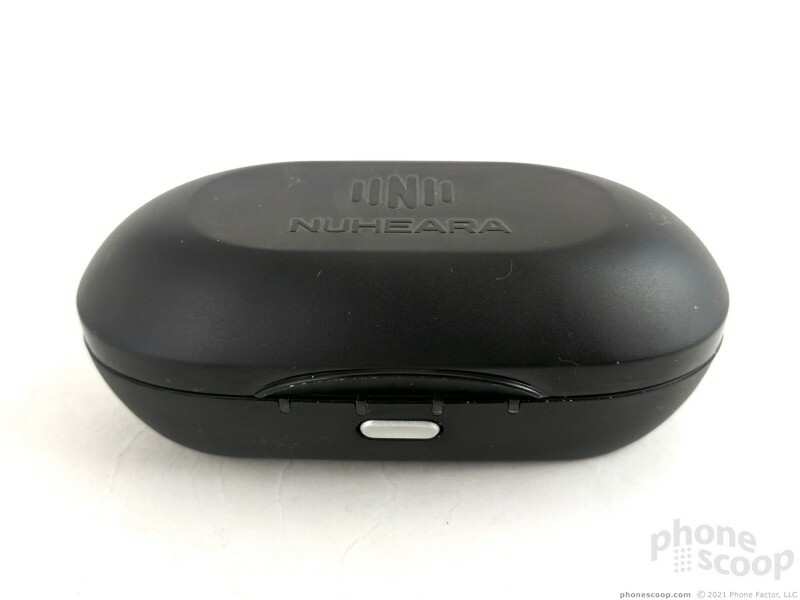 Nuheara's IQbuds have a sophisticated yet simple look to them. Nuheara picked conservative black and chrome colors and formed them into round pods with a flat outer edge. I like the basic appearance. They're modern chic-ish. 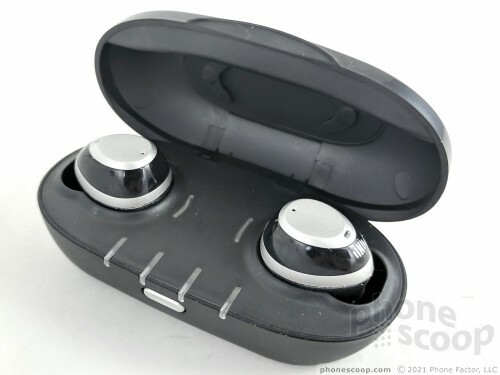 As is typical for this form factor, the earbuds are made of plastic. I wouldn't call them rugged. The Jabra Elite Sport, for example, are made of much tougher materials. 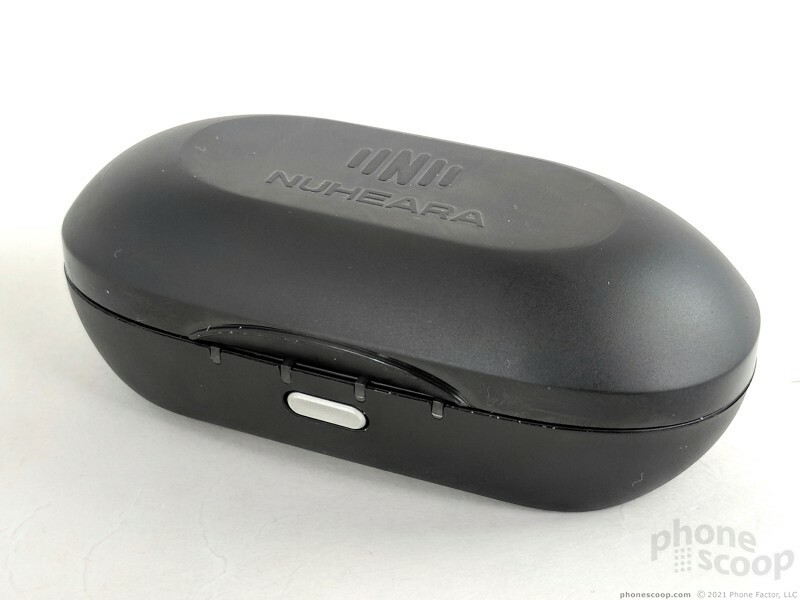 Nuheara used a rougher plastic along the inside of the earbuds where they fit against your ear. The outer black shell is polished and shiny. The chrome band that separates the two major halves creates a really small lip on the inside. It didn't bother me while I tested/wore the Nuheara's but I imagine some might notice it. The strongest part of the assembly is the stalk that fits into your ear canal. There are no physical buttons to press. Each bud has a capacitive touch surface that responds to short presses, double presses, and long presses. Some actions, such as activating Siri or Google Now, are available from either bud, while others, such as answering/rejecting calls, are available from only the left or right bud. I had no trouble using these touch surfaces for their defined actions once I sorted them out. I will say this, however: reaching up to adjust the earbuds or tuck them further into your ear often resulted in activating the touch controls. That got old. 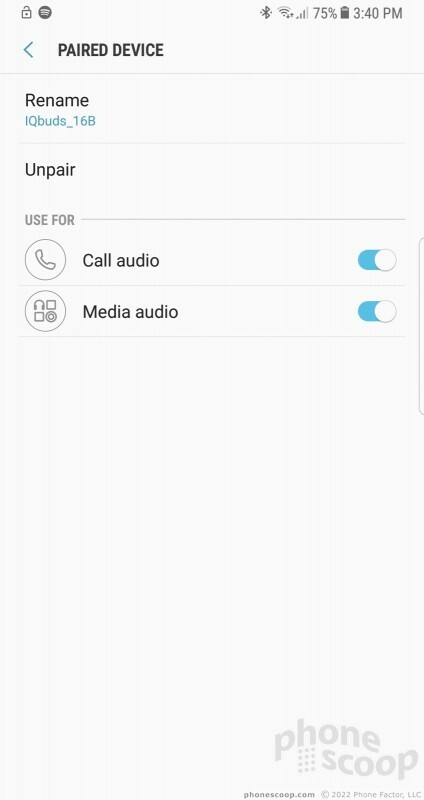 Further, you can't adjust volume directly from the earbuds, nor can you skip forward or backward in your playlist. That got old, too. Nuheara ships the IQbuds with eight different eartips (four rounded, four oval) in different sizes to help you find the perfect fit. The large oval shape fit me exactly, but I wish Nuheara included eartips in something other than rubber; there's no foam option. 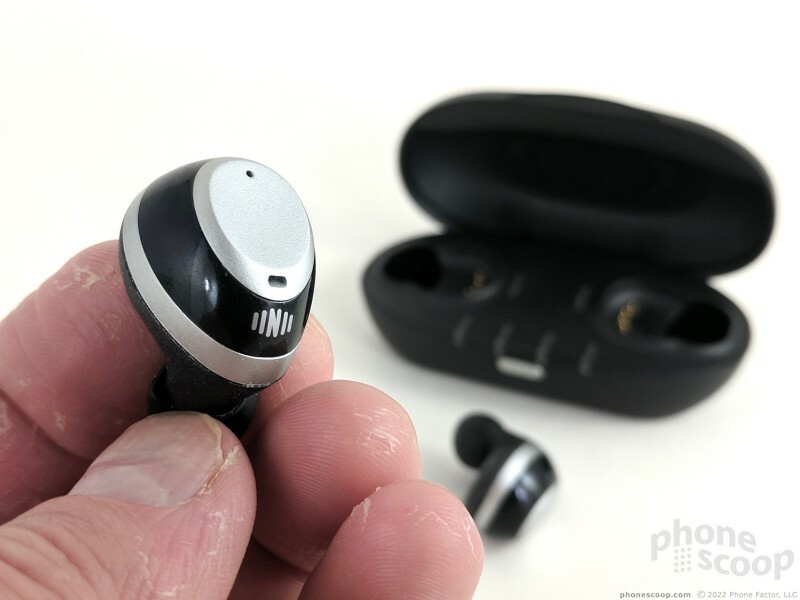 The IQbuds don't include earwings, either, which some competing models do offer. Even so, the included eartips provided enough stability and grip in my ear that the IQbuds didn't fall out as I completed various activities around the house. Fully wireless Bluetooth earbuds demand a carrying case that doubles as a charger. 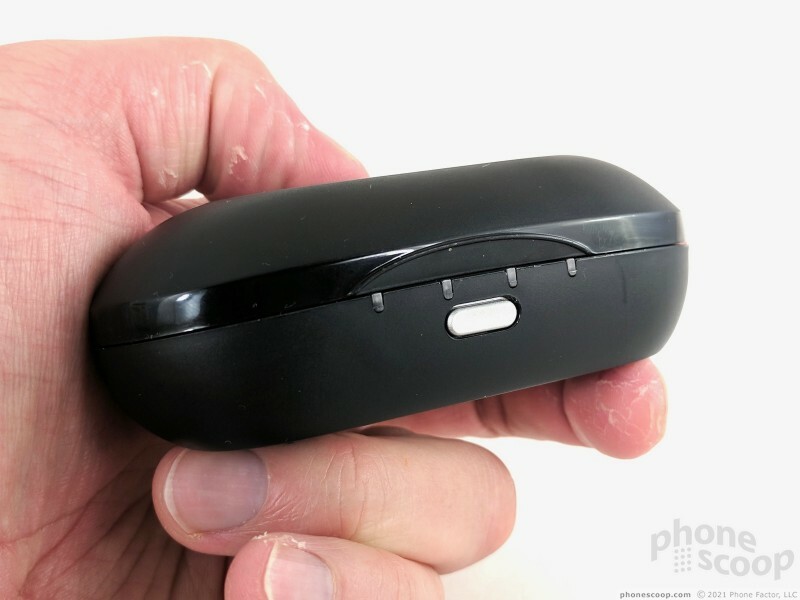 The IQbuds ship in just such a container. 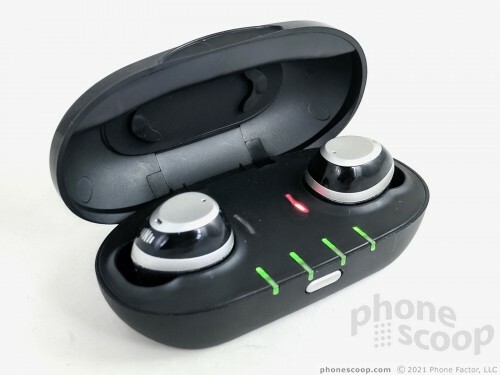 It's one of the more sizable charger cases I've seen for this type of earbud. It looks like a giant pill. Flat top and bottom surfaces mean it will sit on level objects without rolling off, though the ends are somewhat rounded. The case is comfortable to carry around, and will easily fit into a loose jacket pocket, purse, or backpack. The materials and build quality are sturdy. Most of the case is covered with matte plastic that has just a bit of grip. An oval button on the front lets you check the charge level, which is indicated via four LEDs. 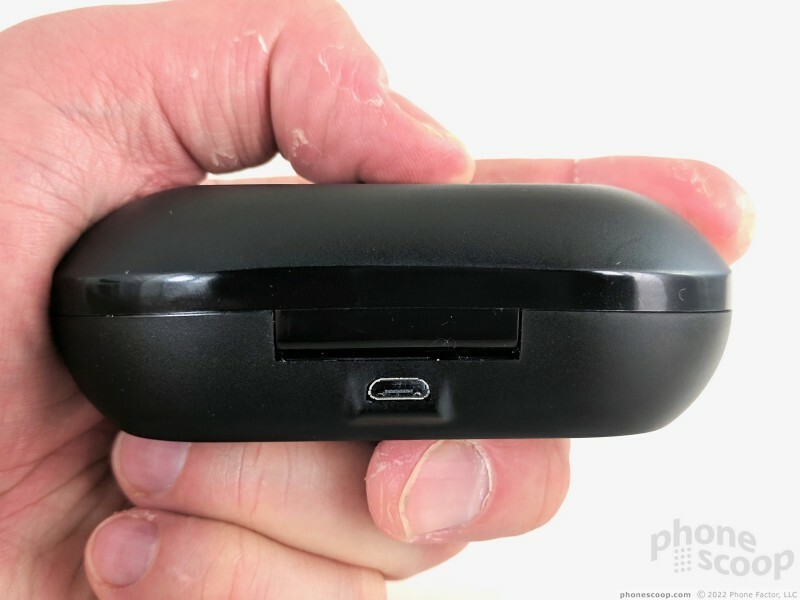 The microUSB charging port is located on the rear. Whenever you open the case, it will flash the charge level at you for both the case and the individual buds. I like that the buds fit into either of the two cavities. As long as the copper pins make contact, they'll charge. The IQbuds require more care than competing models. For example: several times, I dropped the buds in the charger but they didn't settle into their respective cradles properly. That means they didn't charge overnight and left me with dead buds come morning. You have to take a moment to properly seat the buds. I worry that jostling the case (such as in a backpack) may unseat the buds accidentally. Every other wireless earbud I've reviewed had idiot-proof chargers. 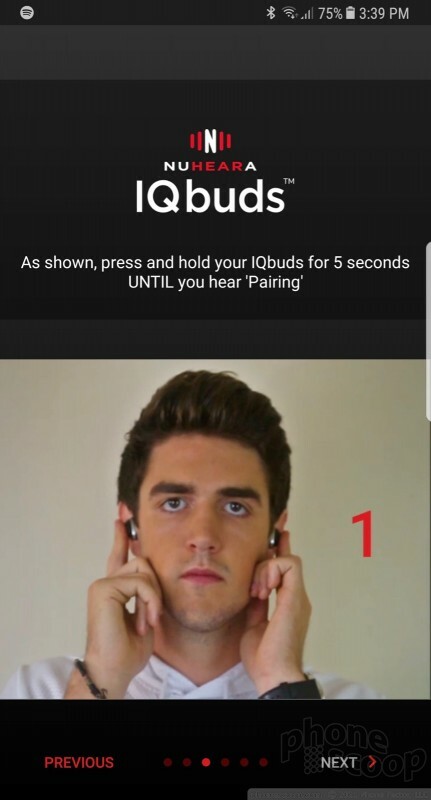 The IQbuds made me feel like I had a low IQ. 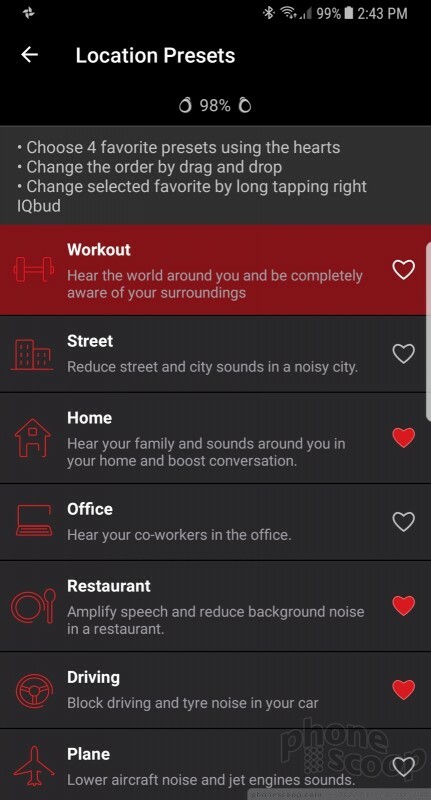 Nuheara's IQbuds app is available for free from the iTunes App Store and Google Play Store. It's necessary to adjust and use the headphones' advanced features. It's only about 15MB, so don't worry about it hogging up too much space on your smartphone. 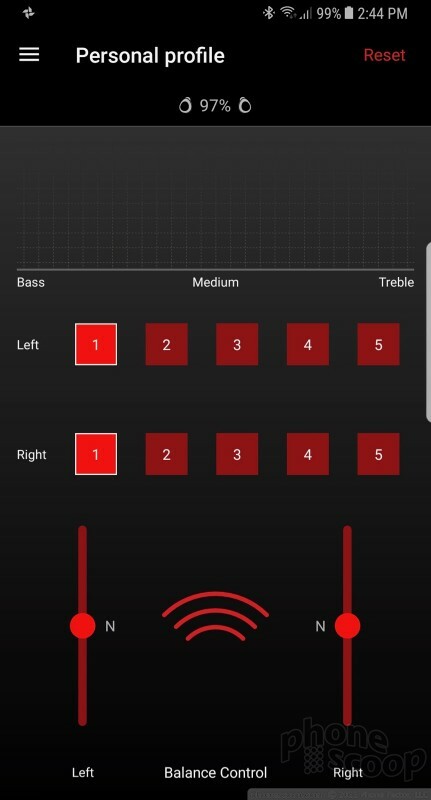 The app will walk you through the process of charging, wearing, connecting, and using your IQbuds thanks to a step-by-step tutorial. There are three basic sets of controls for the IQbuds, the first of which is a master control for the outside world. 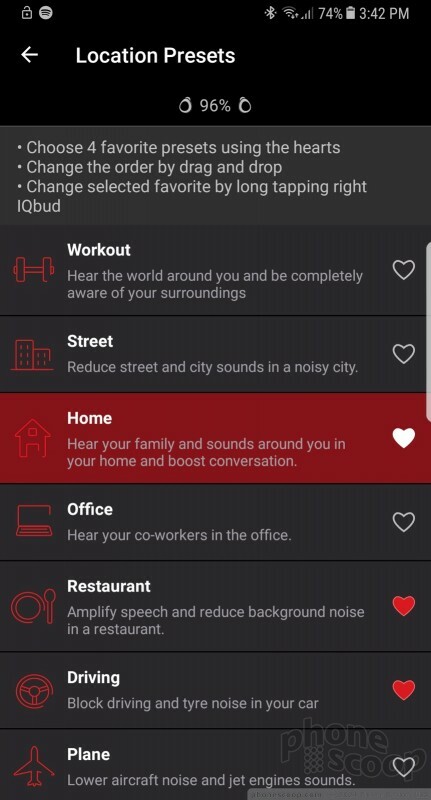 You can turn the world off completely if you wish, which gives you the maximum amount of noise reduction and the most peaceful listening environment. Or you can leave the world on and dial in a more exact level of noise cancellation. 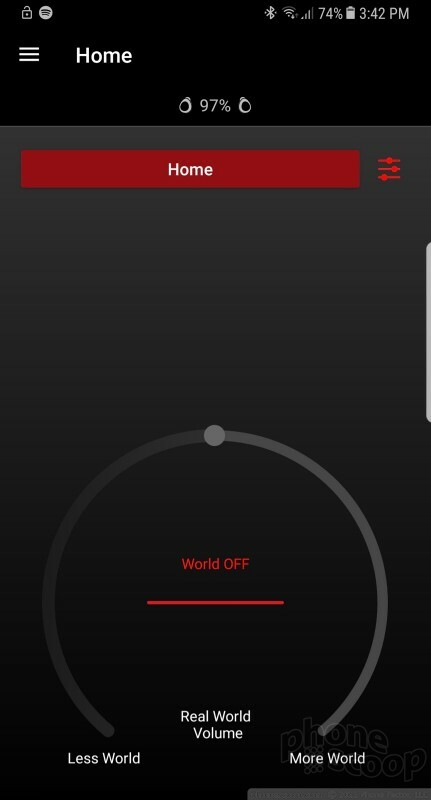 Spin the software dial towards "less world" and things will be quieter even though you can still hear what's going on around you. Spin the dial to "more world" and you'll begin to hear everything through the IQbuds' mics. 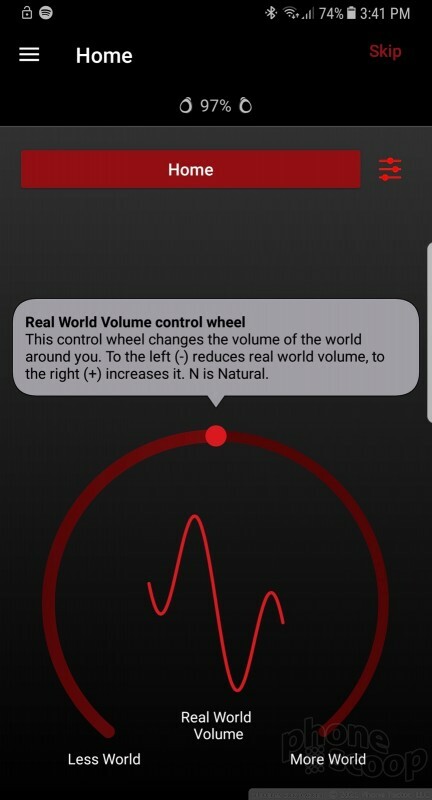 The world controls impact everything else you do with the IQbuds, and there are two sub-controls: SINC and World EQ. 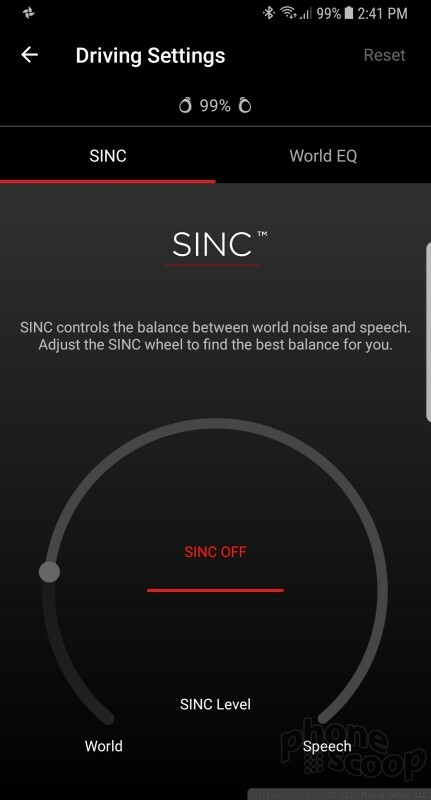 SINC, or super intelligent noise cancellation, specifically targets noise cancellation when you're not listening to music. Perhaps you're in a very crowded and noisy restaurant and wish to hear only those at the table with you. 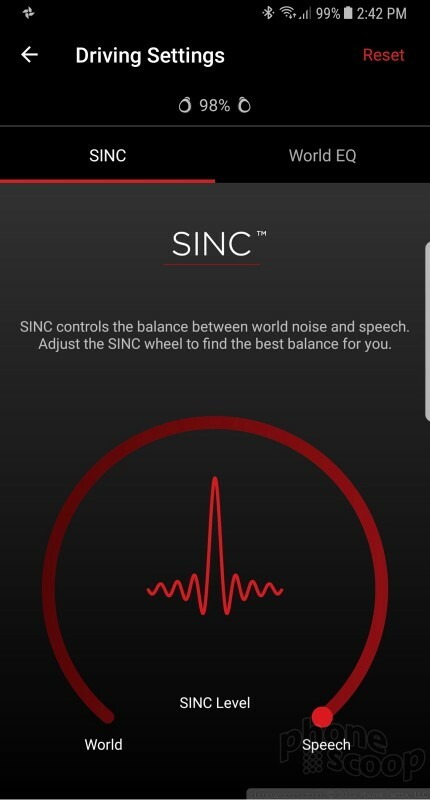 Using SINC, you can tune out all the background din, or leave it all in, or attempt to find a happy medium in between. This may help people who have a hard time hearing voices above large groups of chatting diners. 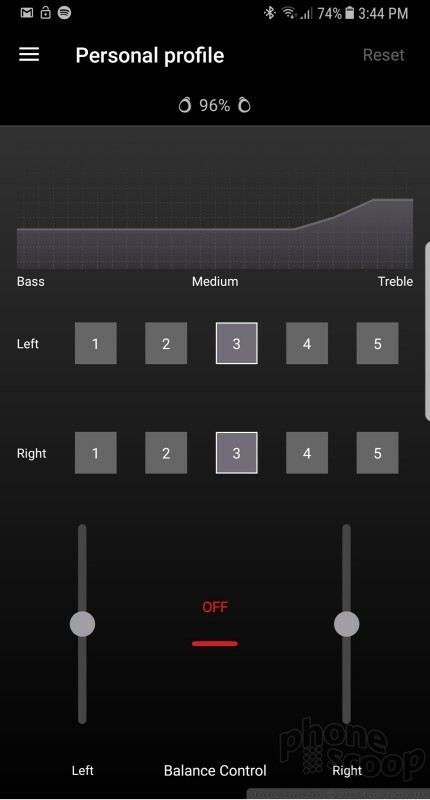 If you want, you can dive even further into the application and create custom sound profiles for each ear. Moreover, the IQbuds can save up to four presets for various locations. For example, you can create a profile for when on an airplane, when in your office, when you're walking down the street, and when you're driving. 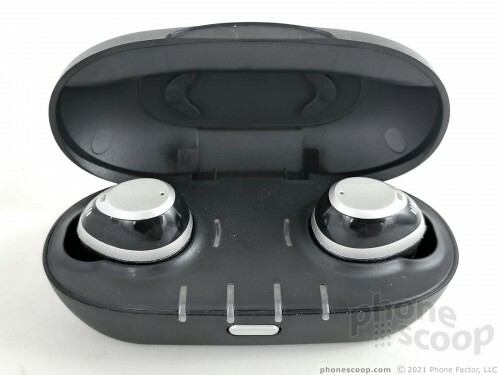 These let you instantly tap into the amount of noise reduction you prefer for each of those scenarios. This is really advanced stuff, and I have to say it all works very well. You can hear an instant difference in the sound when you adjust the various controls and dials. My daughters had a bunch of their friends over one afternoon and I was able to tune out all the high-pitched shrieking during the visit. The left IQbud contains the Bluetooth radio and Nuheara suggests you keep your smartphone as close to the actual left earbud as possible. In fact, it recommends using an armband or dropping your phone into a shirt pocket. Nuheara suggests that putting your phone in your left front pants pocket might not deliver the best results, but it's better than your right front pants pocket. Why does Nuheara makes these unusual suggestions? Because its Bluetooth radio is garbage. 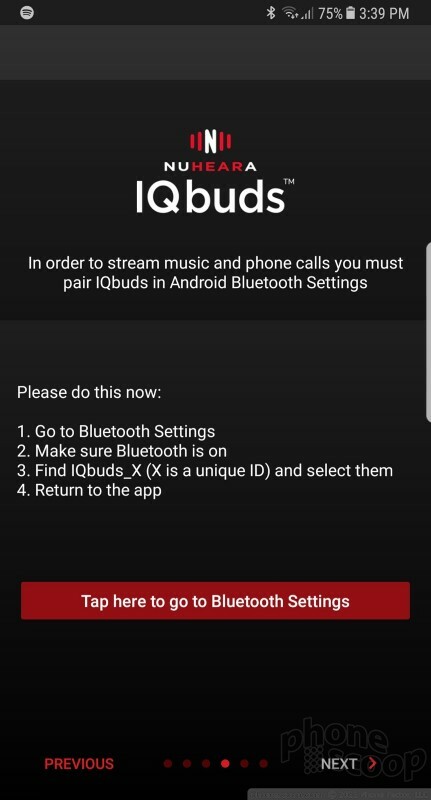 It took me about a half dozen attempts to pair/connect the IQbuds with my smartphones. I tested the earbuds with a Samsung Galaxy S8 and an iPhone 7 Plus. The process was annoyingly fraught with repeated dropped attempts on both devices. After I made the initial pairing and connection, though, the buds generally reconnected right away when I pulled them out of their charging case. 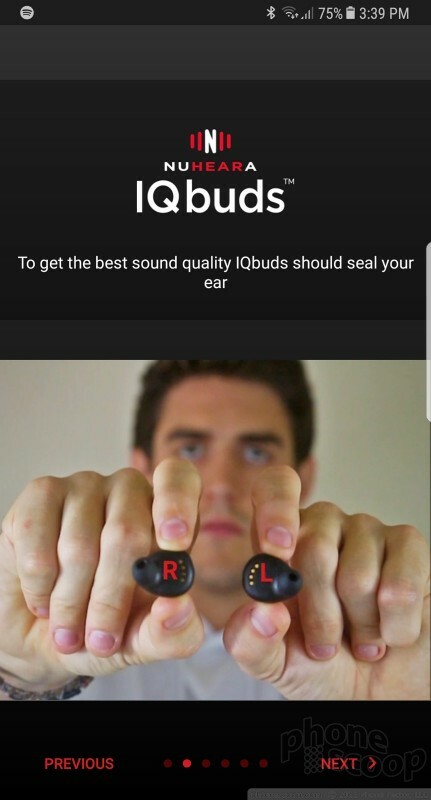 More to the point, however, the IQbuds simply do not deliver a seamless music playback experience. Music drops constantly, no matter how close your phone is. I doubt I listened to a single song without experiencing at least two or three drops. Some songs were rife with dozens of drops. The drops were lightning quick, perhaps as brief as a tenth of a second, but those blips in time add up to one frustrated Eric. It really ruins the whole thing — at least as far as music playback is concerned. Bluetooth range is among the worst I've seen. 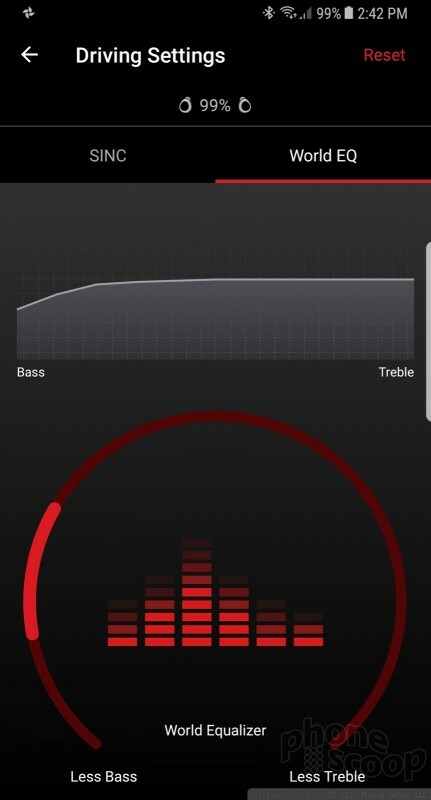 There's no way the IQbuds stay connected even across the usual 30 foot distance. The IQbuds disconnected entirely at around 22 feet. That's limiting. It's hard to get past this behavior. Maintaining the Bluetooth connection is a basic feature that you have to nail to succeed with this form factor. 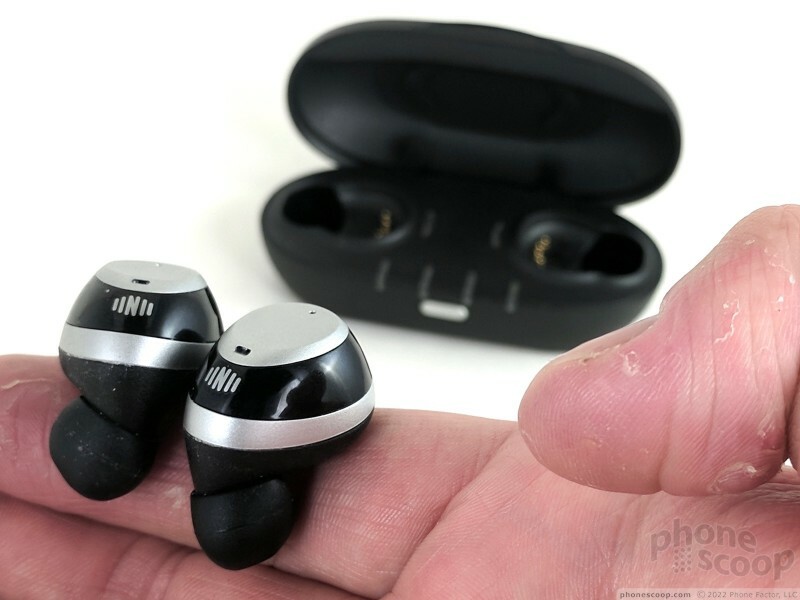 As for music quality, the IQbuds manage to deliver a nice experience with little to no effort. The IQbuds sounded really nice right out of the box. 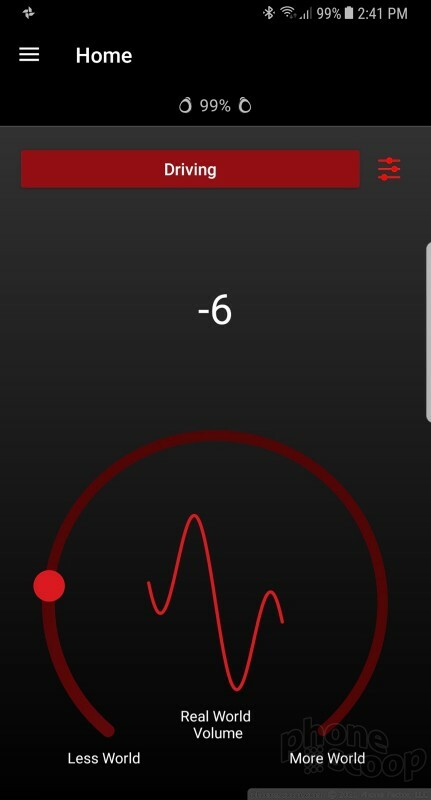 I didn't have to fuss with my phones' music apps to dial in a better EQ curve or take any action to enjoy a nice, balanced sound from the IQbuds. Of course, if you want to mess with the sound you absolutely can. 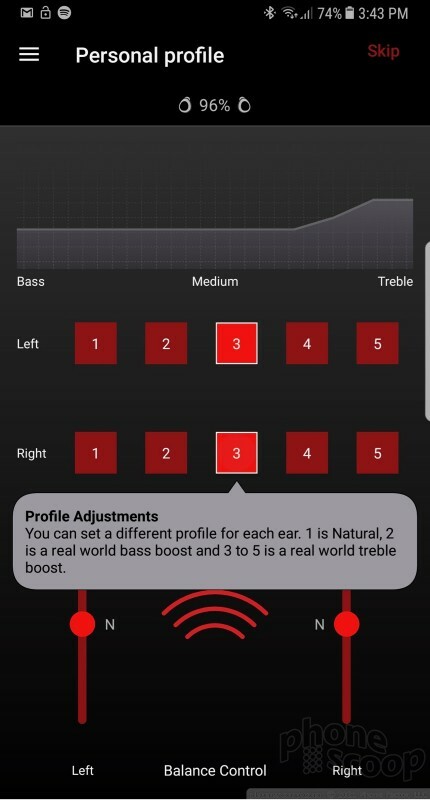 The IQbuds app itself lets you perform some minor tweaks, which can be enhanced by your individual music applications. I was very pleased with how clean a variety of different music genres sounded via the IQbuds. The noise cancellation absolutely works. When I elect to use Nuheara's controls to turn the world off, outside sound drops to basically nothing, and all you hear is your music. This is great. I disn't even hear a low hiss, which is sometimes common to ANC headphones. Moreover, the advanced ANC controls truly impact your experience with the outside world and let you dial in a sweet spot between creating a peaceful zone while still maintaining a safe level of awareness of your surroundings. Battery life is good, as long as you get the IQbuds charged up properly. The earbuds on their own support four hours of music playback, or eight hours of generic active noise cancellation, on a single charge. The case can recharge the IQbuds a total of three extra times, meaning you get 16 hours of music playback or 32 hours of quiet time via ANC. As noted earlier, you have to carefully insert the buds into the charging case and ensure they've made contact with the charging pins. I had some trouble with this. It takes four hours to charge the case and about 1.5 hours to charge the buds. 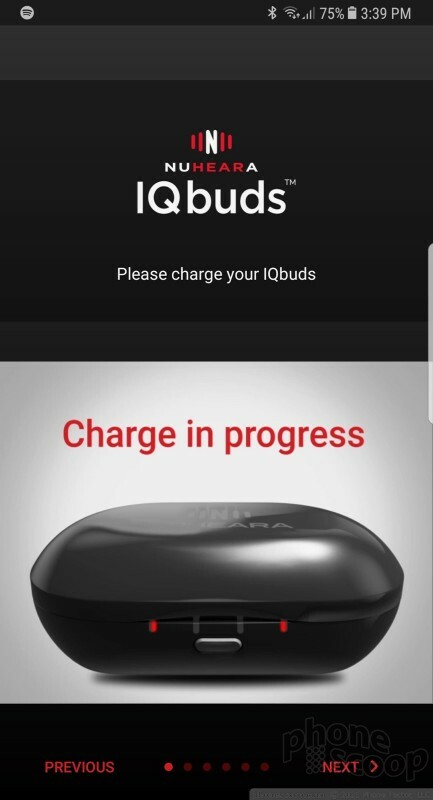 I found the IQbuds lived up to Nuheara's battery life claims, plus or minus 15 minutes here and there. 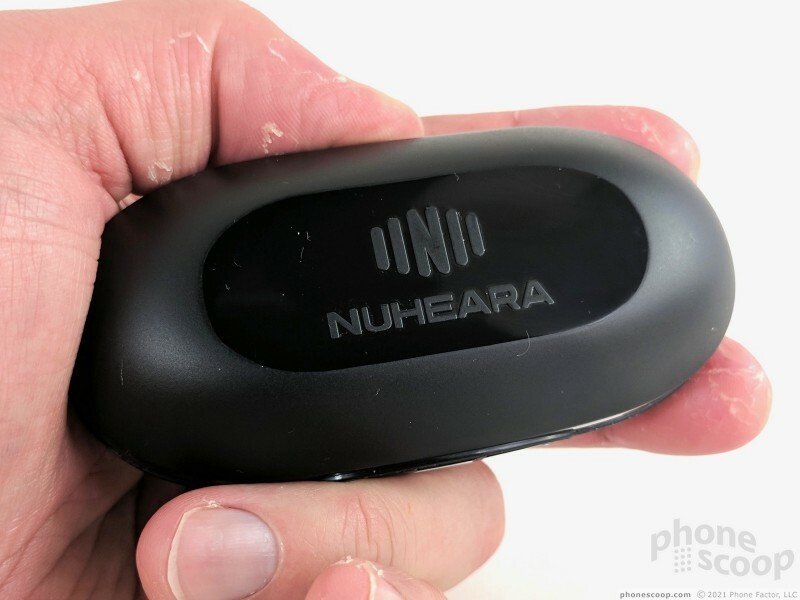 Nuheara promises a lot from its IQbuds, but it doesn't quite deliver the goods. 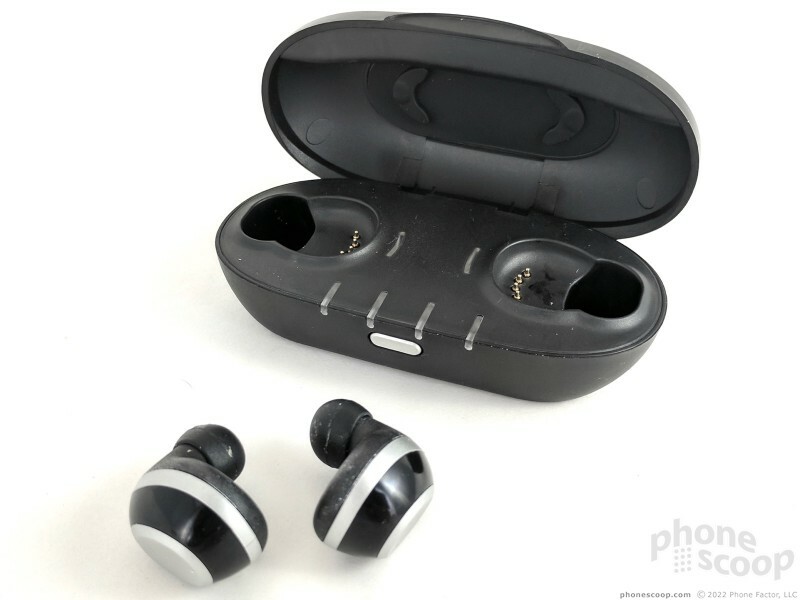 The individual earbuds are classy looking and well made, but the capacitive touch surface can be frustrating to use. The charging case is fussy about charging the IQbuds, which can leave you totally hanging if don't seat the buds properly. On the plus side, the IQbuds are incredibly comfortable to wear. 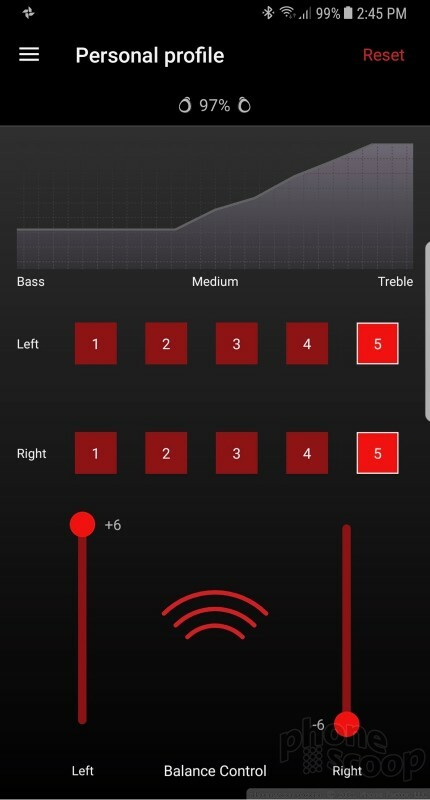 The application and software for controlling the IQbuds is quite powerful. I easily found the settings I prefer for drowning out the rest of the world so I could enjoy my music in relative peace. 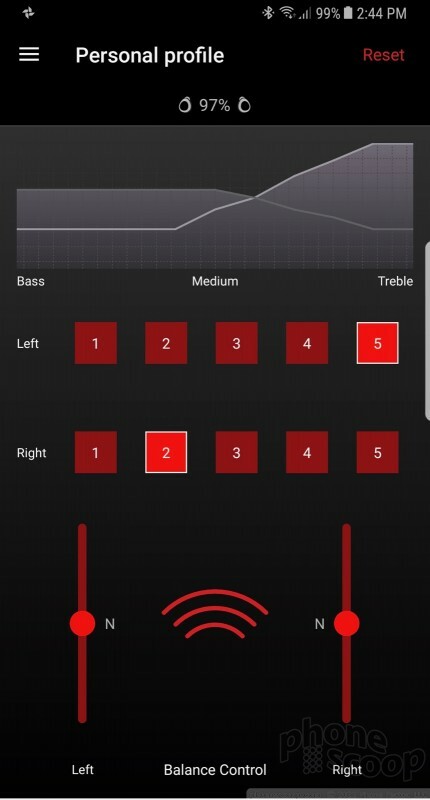 Even when not listening to music, the IQbuds and SINC tools allow you to reduce the din so you can hear individuals speaking directly to you. This is very cool stull, and clearly the future of ANC. 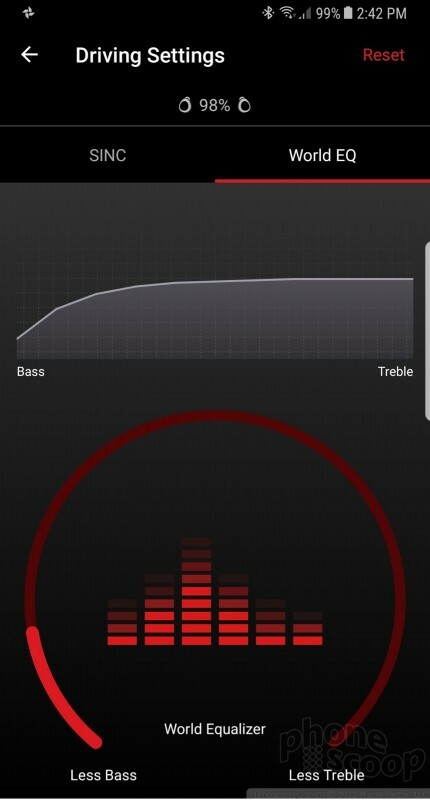 My biggest gripe is the Bluetooth connection, specifically with respect to music playback. Music may have had a great, balanced sound, but the constantly dropped stream aggravated me to no end. 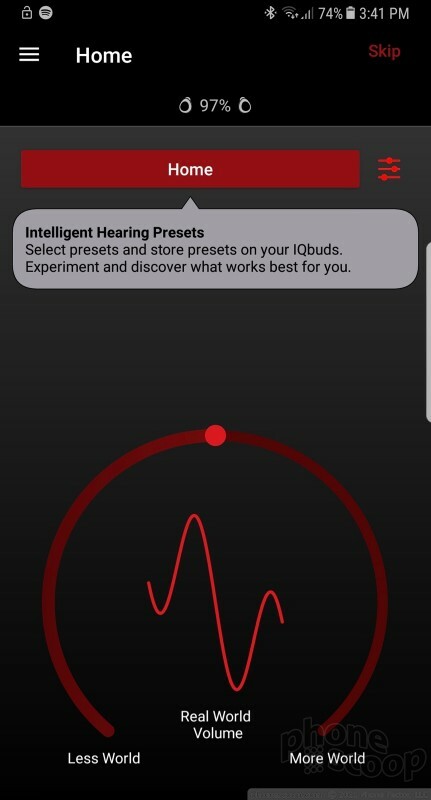 The in-and-out connection isn't as noticeable if you're using the IQbuds simply to reduce background noise. 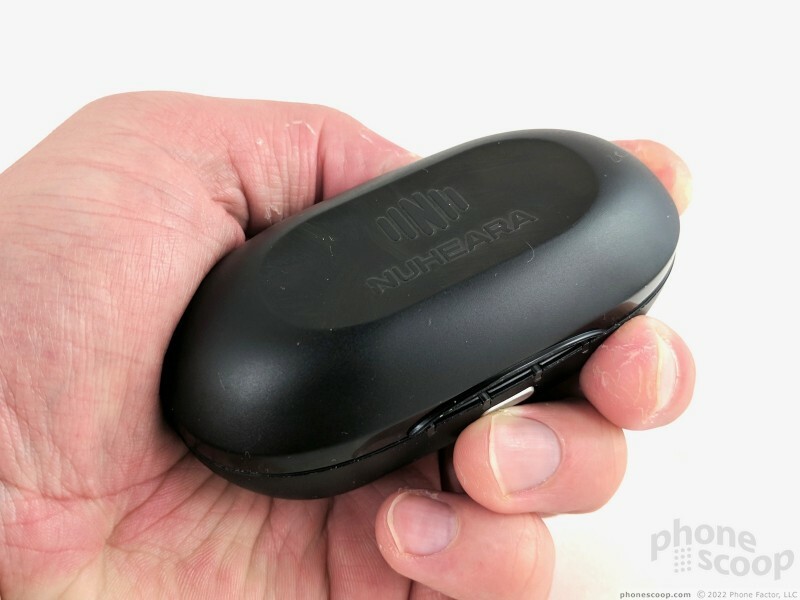 Nuheara charges $299 of the IQbuds. That's a lot of green. If you're interested in them more for environmental active noise cancellation, then perhaps they'll strike the right chord. If you're looking for a great music experience, however, the IQbuds don't stay in tune. Ultimate Ears' Roll 2 is a compact, rugged, waterproof speaker that's ideal for summertime, on-the-go action. Its odd shape and coloring give it some character in a me-too market full of alternatives. Portable Bluetooth speakers are often great summertime companions, and allow us to add a soundtrack to our warm weather adventures far and near. If you're looking for an inexpensive option to enhance your beach or mountain getaway, consider the WonderBoom from Ultimate Ears. 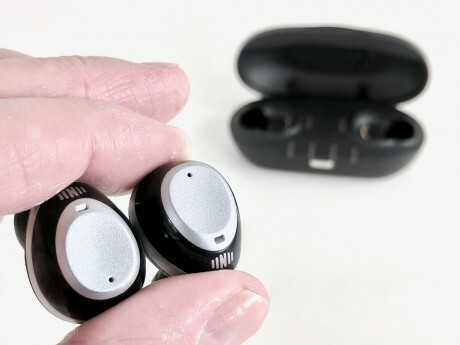 Nuheara debuted a new set of fully wireless earbuds at CES this week called the IQbuds Boost. 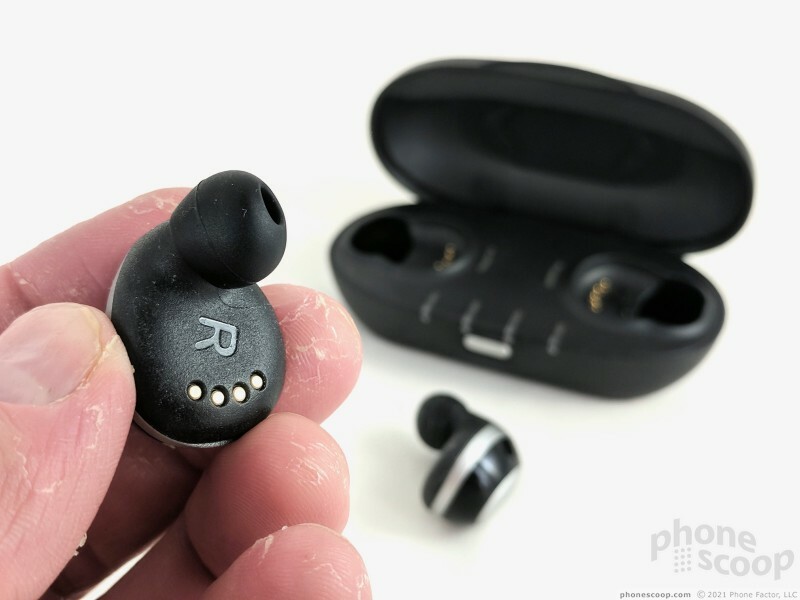 The earbuds have refreshed casings when compared to last year's IQbuds and offer an additional 1 hour of battery life per charge.